See our model 2267 tow ski at the Outdoors Weekly booth during the Hard Water Ice Fishing Expo in Blaine, MN next week. We will also be running the advertisement shown below in Outdoors Weekly and Ice Fishing Tournament Guide. We have taken valuable feedback from our loyal customers and developed two additional models of our tow ski. Model 2264 and 2267 offer new features that make our tow skis more compatible with more makes and styles of fish houses. One common feature between the two is the deeper cut out on the backside of the ski plate. It has been extended further inward to allow for easier positioning of the hitch ball on the ski with the coupler on your trailer. Some makes/models of ice shacks have a tongue jack that is very close to the trailer coupler. In these particular cases, the new cutout wraps around the post on the tongue jack of your ice house, putting you in a better position for a quick connection. Shown above is Model 2267 with a late model Ice Castle. Notice how the increased cut out depth allows for connection to the trailer without moving the tongue jack or dropping the trailer down. Once the ski is connected the tongue jack can be removed or rotated into travel position. In addition to the deeper cutout, Model 2267 has a modified rear fork. 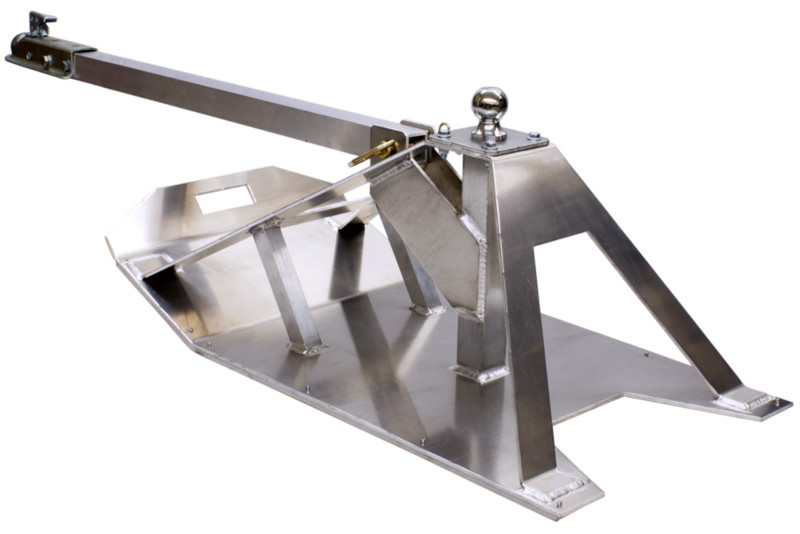 This provides additional clearance for ice shacks that have a heavy trailer frame that runs all the way to the front of the trailer. This feature may be advantageous in other situations as well, depending on your trailer frame and coupler setup. We continue to welcome all feedback. If you have some thoughts on our products that you would like to share with us, please send us a message through our contact page or give us a call. We keep all customer information and feedback private. Thank you for your continued support and patronage. See you on the ice! Shown below is a recent shipment of Snow Tow skis headed to one of our North Dakota dealers. We can ship with the entire ski pre-assembled, so that they're ready to use right out of the box. Eight skis easily fit on one pallet, making shipping very economical.